This section provides an introduction to various kinds of non-surgical and surgical feeding tubes, including nasogastric (NG), nasojejunal (NJ), orogastric (OG), gastrostomies (G-tube or button), and gastro-jejunal (GJ) tubes (also known as gastro-enteral tubes). Other tubes used less commonly (such as gastro-duodenal tubes) are not discussed in this section. The section covers the differences between these tubes, how they are placed, and common issues. Feeding tubes are alternative ways to enter the gastrointestinal system while bypassing the mouth. Feeding tubes are used for children who need additional help to gain weight or protect them from complications from oral feeding, and to ensure that the child receives enough fluids to stay adequately hydrated*. These tubes also provide options to give medications when a child can’t or won’t take them by mouth. Tubes also can help to vent (relieve gas) and remove or drain unwanted fluids from the gastrointestinal (GI) tract. This section explains the basic differences of the various feeding tubes and gastrointestinal ostomies, and addresses common questions and concerns. The resource links provide useful additional opportunities to learn more about these topics. Decisions about placing and removing any tube that goes in the body can be difficult. It is important for families and medical personnel to discuss benefits and possible risks associated with the various options before making a decision. *Note: Intravenous nutrition, known as total parental nutrition (TPN), is not addressed in this section. Parts of the Digestive Tract. This diagram is provided as a reference to help visualize where the various feeding tubes extend into the body. By Mariana Ruiz Villarreal (LadyofHats) (Own work) [Public domain], via Wikimedia Commons. Severe reflux and the need for preventative surgery to prevent it (Nissen fundoplication) - a feeding tube will usually be inserted at the time of reflux surgery. The need for an alternate route to give medications, fluids, or an unpalatable diet (ketogenic diet formulas). These three types of tubes are temporary tubes placed manually through the nose or mouth into the stomach or small intestine. Nasogastric tubes are put in by passing a thin, flexible tube from a nostril, down the back of the throat through the esophagus, and into the stomach (see diagram below). These can be placed at the bedside by medical personnel. Parents or caregivers can also do this easily with a little training and if they do it often may actually be more comfortable doing this than the child’s physician! The length of the NG tube is determined by measuring from the tip of the nose, to the ear, and then to the stomach (halfway between the rib cage and umbilicus) and then marking this length on the tube that will be inserted. Liquid nutrition can be given through the NG feeds in larger intermittent amounts called boluses, or over longer periods of continuous feeds (such as night feeds) and can be delivered by gravity or with a pump. Sept. 15, 2006, via Creative Commons. Nasojejunal (NJ) tubes need to extend further past the stomach and into the small intestine. The first part of the small intestine is called the duodenum, and ideally the NJ tube extends past the duodenum to better anchor it into place. For children who cannot have feedings into their stomachs, NJ tubes are often the next alternative. NJ feeds are run over longer periods continuously using a pump. NJ tubes can be more challenging to place since they can curl up in the stomach unintentionally. Typically NJ tubes are placed (and replaced) with the help of radiology, such as an x-ray to confirm the placement is correct. Both NG and NJ tubes have a disadvantage that they can be easily dislodged or completely pulled out while a child is moving around or having cares done. While the initial placement of a tube can make a child gag and feel uncomfortable, usually an NG or NJ tube is well tolerated once the child becomes used to it. OG tubes are sometimes used in the hospital during acute or surgical care for drainage of the stomach. OG tubes are passed into the mouth, down the esophagus, and end in the stomach. These tubes are larger in diameter and can help with draining the stomach either as a vent or hooked up to suction. OG tubes typically are less comfortable for children as they can trigger gagging. Ostomies generally refer to surgically created pathways to enter or exit the body, such as a gastrostomy that is a pathway to the stomach, or a jejunostomy that is a pathway to the jejunum (part of the small intestine). The site where the gastrointestinal tract (stomach or intestine) is pulled up to meet the skin heals into an opening called a stoma. There are many other kinds of ostomies in the body not covered in this section, such as colostomies and ileostomies as exits for chime (digested food and fluid) or stool, tracheostomies for respiration, and urostomies for removal of urine. Stoma nurses (or enterostomal teams) have specialized experience in caring for common problems such as irritation or leaking. 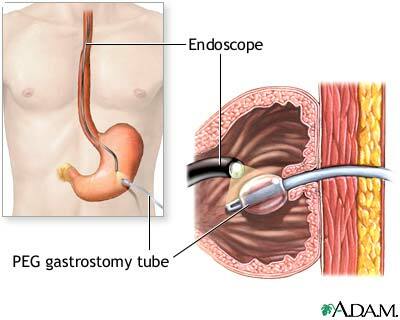 A gastrostomy tube ("G-tube") is a gastric feeding tube, passed through a gastrostomy, designed for the administration of liquid nutrients, fluids, or medications. This tube often is placed endoscopically using a videoscope is passed through the mouth, down the esophagus and into the stomach, to guide insertion of a tube through the abdominal wall accessing the stomach. The procedure is also known as Percutaneous Endoscopic Gastrostomy, or PEG tube placement. The procedure can be performed by a gastroenterologist or a surgeon. The site typically heals in about 1-3 weeks. A temporary tube may be in placed initially and later replaced with a low-profile or “button” device (with balloon or non-balloon internal bolsters). G-tubes are placed in children who tolerate feedings into the stomach but who are unable to orally consume enough calories to maintain adequate nutrition and growth or who are at risk for aspiration of oral feedings due to difficulty with oropharyngeal control, esophageal motility, and/or gastroesophageal reflux. [Sleigh: 2004] G-tubes are often considered for children who use NG tubes for an extended period of time because the G-tubes eliminate problems with nasopharyngeal irritation, are much less likely to pull out and can be concealed under clothing for improved privacy. G-tubes can be changed when leaking or approximately every 6 months; however there is not expert consensus on how often to change a functioning G-tube. A number of studies have focused on the use and safety of G-tubes. For example, improved weight gain after G-tube placement has been demonstrated in children with cerebral palsy who were previously failing to thrive. [Patrick: 1986] Controversy exists over increased risk of death and gastroesophageal reflux following G-tube placement. [Sleigh: 2004] Mothers of children with a gastrostomy tube may spend up to 8 hours per day on care activities [Heyman: 2004], and parents of children with gastrostomy tubes can experience higher out-of-pocket expenses for their child when compared to children without gastrostomy tubes. [Heyman: 2004] Studies such as these give general insights into caring for a child with special health care needs; however, families and caregivers need to discuss the benefits and risks of tube placement and tailor their decision based on the child’s unique circumstances. Many people use brand names to refer to their child’s device, but the generic terminology for the two styles is “balloon” and “non-balloon.” Ask for clarification if someone refers to a device that you are not familiar with. The balloon is breakable, so g-tube changes may be required more frequently than non-balloon devices. Care should be taken to select the appropriate formula – consultation with local nutrition experts or pediatric gastroenterology may be helpful. Formula, milk and water are the only fluids permissible to use through a G-tube. The child should always be held upright during a feeding. Oral stimulation (chewing, sucking on pacifier) is recommended during the feed to promote normal development. Participation at the dinner table, or routine family eating activities should be performed during a G-tube feed to promote socialization. The G-tube should be flushed with water after each feeding to avoid obstruction due to drying of residual formula or medications. Recommended flushes are 5-10cc of water for infants and 15-30cc of water for older children. Venting of gas may be needed for the child’s comfort, similar to burping a baby after a feeding. Venting can be done using an empty syringe, opening the extension catheter to drain air out, or with a specialized decompression tube for Bard buttons. Similarly to the G-tube, a GJ tube passes through the wall of the stomach. Internally however, these two types of tubes are not the same because they provide access to two separate places in the GI tract, specifically into the stomach and the jejunum (2nd part of the small intestine), allowing fluids, nutrition, and medication to bypass the stomach if needed. The tube is held in place with a plastic disk on the outside of the abdomen and a balloon or plastic bumper on the inside of the stoma. There are 3 ports located externally: the G, the J, and the balloon. If a child has a G-tube already, it can be converted into a GJ tube using interventional radiology rather than through another surgery. The GJ option enables the care team to be selective about what enters the stomach, if anything. If a child receives all medications, fluids, and nutrition into the jejunum, the G portion still enables the stomach to be vented. Due to the jejunum’s narrower shape, jejunal feeds must be given at a continuous rate by pump, rather than as boluses (larger volumes given more quickly) which can be given into the stomach at intervals (more like established meal times). Replacing a GJ is more technically difficult than replacing a G-tube and requires experienced medical personnel. Typically GJ changes are scheduled every 3 months and often can be replaced over a wire, thus minimizing fluoroscopy time. Unscheduled replacement of a dislodged GJ tube can be more time consuming. To prevent medical errors and improve patient safety, it is important to think about which medications, formulas, and supplements are given, how they are formulated (liquid versus pill, immediate-release formulations versus time-release, etc.) and how they are metabolized (processed) in different parts of the body. All prescription medications, over-the-counter medications, supplements, and natural or holistic remedies need to be discussed with the medical provider and pharmacist to help prevent interactions. Medical errors can arise from crushing certain medications, mixing medications together for administration, or even mixing certain medications with nutritional formulas. Some medications, including some liquids, require diluting before administering through a tube. The tube may become clogged or deteriorate with exposure to certain chemicals and formulations. Co-administered liquid medications can alter the pH and cause denaturing of either or both medicines. Viscous liquid medications may adhere to the interior of the tube, despite flushing. Immediate-release products are more likely to be able to be crushed and given by tube, however the finer particle size caused by crushing can still change the drug’s metabolism in the body. Extended release or enteric coated pills, tablets, or capsules are not designed to be crushed and given through a feeding tube. Feeding tubes should be flushed between each medication. The site of administration needs to be considered as well. Medications given by mouth (oral route or “PO”), into the stomach (gastric route, via NG, OG, or GT), and into the small intestine (enteric route, via NJ or duodenal, or jejunal tubes) are not metabolized the same way in these different parts of the body. Certain medications, such as proton pump inhibitors, warfarin and oral iron formulations are absorbed above the jejunum (the second section of the small intestine), and should be given into the stomach to be most effective. Pharmacists are trained to work with patients and prescribers to prevent medical errors and to optimize use of the medications and supplements, so it is important to consult a pharmacist directly. Parents should clamp the g-tube or close the valve prior to bathing the child. Avoid overtly hot water, which could irritate the surrounding skin. Use mild soaps and soft washcloths to avoid further irritation and abrasion. Granulation tissue represents a foreign body reaction in the skin surrounding the tube. It is red/pinkish inflamed epithelial tissue. Excess granulation tissue can be controlled or reduced by topical application of triamcinolone cream three times daily for a week, or cauterized using silver nitrate sticks obtained through a physician. Major complications in a retrospective cohort of 208 patients with gastrostomy placement by interventional radiology included peritonitis (3%), and death (0.4%). [Friedman: 2004] Spearing or poking the transverse colon can occur, requiring surgery to fix. Children can pull-out their g-tube directly or inadvertently through contact or traction while playing. Dressing children in a "onesie," a one-piece undershirt with the tube tucked inside, or placing the end of the tubing under the tabs of a disposable diaper can help avoid the tube being pulled out. Using an abdominal binder can also help protect the tube from being pulled out. A dislodged GJ tube typically requires fluoroscopy to replace. Leaking is a common problem with feeding ostomies. Ensuring that the tube is properly placed and, if there is a balloon, that the balloon is properly inflated, can reduce leaking. Balloon style buttons for children vary in the volume contained in the balloon. Typically this is 3 mL (cc) for infants up to 1 year and 5 mL (cc) for older children. If unsure, contact the physician who placed the button. Other factors such as granulation tissue, damaged or displaced tubes, or weight changes can affect the fit of the tube. Leaking may also occur if the stomach is too full, which can happen with poor gastric motility (slow emptying) or with rapid bolus feeds. Commercial vendors include many businesses started by entrepreneurial parents who recognized the need for adaptive and protective clothing to help protect privacy and prevent tubes from being pulled out. The Medical Home Portal does not endorse any of these products but has provided this information as an example of this type of resource. TodBods is a commercial site offering sales of larger-sized onesies (shirts that snap closed in the crotch) for kids with feeding tubes, sizes 2T-6T. Adaptations by Adrian is a commercial site offering sales of adaptive clothing including onesies, sizes small child to 2XL adult. This clinical report provides (1) an overview of clinical issues in children who have developmental or acquired disabilities that may prompt a need to consider nonoral feedings, (2) a systematic way to support the child and family in clinical decisions related to initiating nonoral feeding, (3) information on surgical options that the family may need to consider in that decision-making process, and (4) pediatric guidance for ongoing care after initiation of nonoral feeding intervention, including care of the gastrostomy tube and skin site; American Academy of Pediatrics. From the Hasbro Children's Hospital Surgery Handbook – a detailed explanation of what to do when a new (<2 month old) G-tube becomes dislodged. This is for professionals and includes symptoms of dislodgement. Bankhead et al. Journal of Enteral and Parenteral Nutrition. 2009; 33; 122 originally published online Jan 26, 2009. Summary of tips and precautions for medications given by enteral feeding tube from May 6, 2010; Institute for Safe Medication Practices. Online community offering tips and opportunities to ask questions and share stories related to children with special needs and feeding tubes. A very comprehensive, parent-focused site offering information about feeding tubes, their use, and troubleshooting. Website for Primary Children’s Medical Center’s Enterostomal Therapy service, with information, videos, diagrams, and common questions and answers; pertains to G-tubes and other kinds of ostomies. Parent instructions on caring for a gastrostomy tube. Includes cleaning, flushing, giving meds, venting, protecting and problem solving. Parent instructions on caring for a child after having a PEG tube placed. Transcript from 2007 Medical Home conference call; provides information about ostomy care and resolving problems with gastrostomy tubes; includes a "Let's Talk About" on gastrostomies. Includes information about flushing, protecting, adding medications, and solving problems related to gastrostomy-jejunostomy (G-J) tubes. A 26-page comprehensive Parent Guide produced by the Feeding Tube Awareness Foundation. Friedman JN, Ahmed S, Connolly B, Chait P, Mahant S.
Complications associated with image-guided gastrostomy and gastrojejunostomy tubes in children. Heyman MB, Harmatz P, Acree M, Wilson L, Moskowitz JT, Ferrando S, Folkman S.
Economic and psychologic costs for maternal caregivers of gastrostomy-dependent children. Patrick J, Boland M, Stoski D, Murray GE. Rapid correction of wasting in children with cerebral palsy.